What are the Different Types of Flower Pots? Some flower pots are made from terracotta clay. 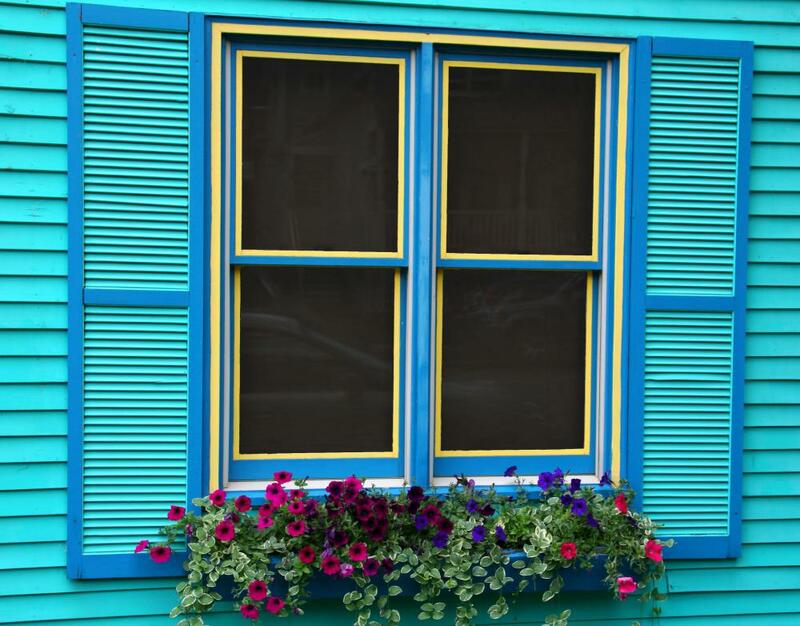 Window boxes are sometimes used to plant flowers. Flower pots, those containers gracing the windowsill or deck, serve several functions and come in a wide variety of styles. Strictly speaking, they are 'plant pots', and most potted plants are of the non-flowering kind. Yet when shopping for a plant container, one never looks for a plant pot, always a flower pot. 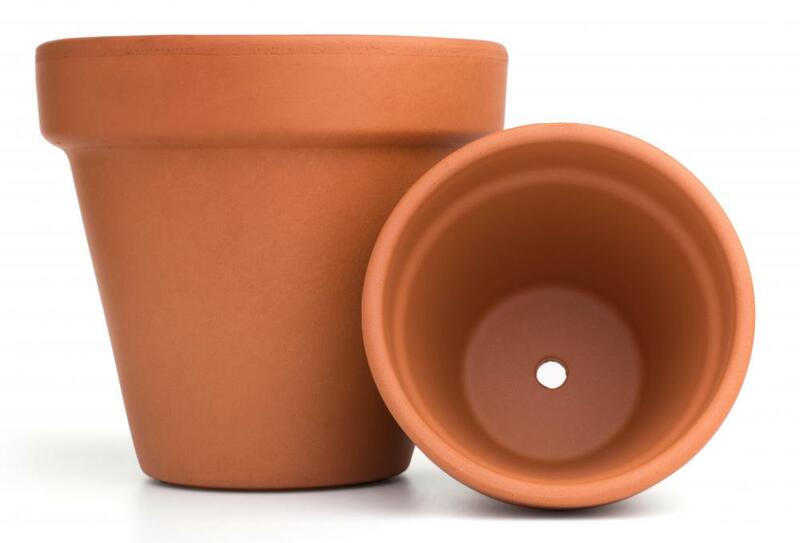 These pots have come into use for the simple reason that they allow you to grow plants that are to some degree mobile. That is, plantings in the ground can't easily be moved to a sunnier spot for a few hours, or brought indoors when it gets cold. Plants in pots, however, can be repositioned at will. Heavier plants such as small trees can be planted in pots that sit on a dolly with wheels for ease of relocation. Flower pots, therefore, are mainly used to make plants mobile. One special case of flower pot is the 'starter pot' or 'peat pot', a small container made of peat moss. Seedlings are sprouted in these pots and, when they are ready to be put in a more permanent home, the entire pot can be planted and the peat will crumble and become one with the soil. This lessens or eliminates 'transplant shock', always a concern when transferring plants from one container to another. The most common type of flower pots are simple terracotta pots. These come with a suitably sized saucer that they sit within, and the pots themselves have a hole in the bottom for drainage. In elaborate pots with oriental motif glazing, you will often find the plant itself sits in a terracotta pot inserted into the larger, more decorative container. Windowsill plantings are made easier with the 'window box', a rectangular box affixed to the outside of the window ledge. Flower pots with plants can be placed in the window box, or you can fill it with soil and plant your herbs or flowers directly in the box. Using pots inside the window box makes it much easier to tend individual plants, however. What Are the Best Tips for Planting Flower Pots? What are the Different Types of Enamel Pots? What is a Double Flower? I kind of like using fiberglass or metal flower pots for my flowers, since it provides an interesting contrast to the whole natural and organic look of the flowers. This look works especially well for apartments, I think, because you have the crisp stasis of the metal or fiberglass pot combined with the little bit of wild nature in the flowers. Also an excellent look for kitchen herb gardens, if your kitchen is done in stainless steel or a chrome look. I have always liked mosaic flower pots -- I think that that's a really interesting look for a flower pot, but natural enough not to look out of place in a garden, especially if they are done in earth tones. Sometimes, if you're willing to put up with a few missing tiles or cracks, you can find discount mosaic flower pots at crazy cheap prices. I actually think it looks nicer to have a pot with a few flaws -- more organic feeling. Really all you need to do is ask at your local flower or garden supply shop, they usually have a few that they'll discount for you. What would be some good tips for painting decorative flower pots? I have always loved the look of hand-painted flower pots, but have never tried it myself. I have a full garden of terracotta flower pots, which just looks so boring to me. What are some good tips to spice up my flower pots? What kind of paint should I get? I assume that you need a waterproof paint since they are outdoor flower pots, but what kind should I get? And is it better to freehand it, or should I start with stencils, do you think?